University of North Texas Press, 9781574417319, 336pp. 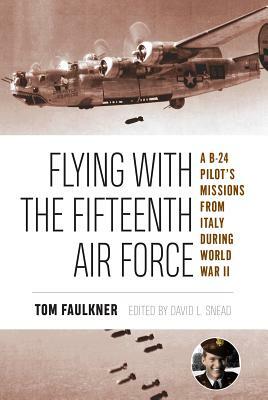 In 1944 and 1945, Tom Faulkner was a B-24 pilot flying out of San Giovanni airfield in Italy as a member of the 15th Air Force of the U.S. Army Air Forces. Only 19 years old when he completed his 28th and last mission, Tom was one of the youngest bomber pilots to serve in the U.S. Army Air Forces during World War II. Between September 1944 and the end of February 1945, he flew against targets in Hungary, Germany, Italy, Austria, and Yugoslavia. On Tom’s last mission against the marshalling yards at Augsburg, Germany, his plane was severely damaged and, while attempting to fly to safety, he was forced down in Switzerland where he and his crew were interned. The 15th Air Force generally has been overshadowed by works on the 8th Air Force based in England. Faulkner’s memoir helps fill an important void by providing a first-hand account of a pilot and his crew during the waning months of the war, as well as a description of his experiences before his military service. David L. Snead has edited the memoir and provided annotations and corroboration for the various missions. TOM FAULKNER piloted a B-24 bomber in World War II as part of the 15th Air Force and received the Distinguished Flying Cross. He lives in Dallas, Texas. DAVID L. SNEAD is a professor of history at Liberty University in Lynchburg, Virginia, and the editor of In Hostile Skies: An American B-24 Pilot in World War II (UNT Press).